This is written primarily for doctors. For patients a better introduction is here. Age-related macular degeneration (AMD) is the leading cause of severe visual impairment in patients over the age of 65 in the Western world. It is a progressive disorder of the macula that causes loss of central (but not peripheral) vision. It rarely causes complete loss of vision and many severely affected people are able to walk, make a cup of tea and go shopping. They are not able to recognise faces, read and watch television. Why is vision lost in AMD? Patients with early and intermediate AMD may have normal Snellen visual acuity as measured by the opticians chart, but suffer from difficulties with activities performed at night such as driving and recognising dimly lit road signs. This is due to loss of rod photoreceptor-mediated dark adaptation in the early phases of the disease. Rods appear to be lost earlier than cones in early AMD. At the same time, drusen appear beneath the RPE. These are small deposits containing amyloid beta or activated complement but do not appear to affect vision in any specific way. 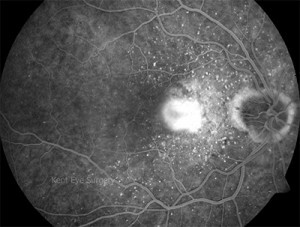 New blood vessels from the choriocapillaris penetrate the RPE basement membrane (Bruch’s membrane) and the RPE itself, invading the retina. These blood vessels are leakier than established vessels elsewhere and leak fluid, fats and blood beneath and within the retina. These eventually heal by scarring (a disciform scar). Approximately 1 person in 10 aged over 80 years or older will have advanced AMD in one or more eyes. A diet rich in greens, fresh fruit and fish oils is thought to reduce the risk of AMD, although definitive studies have yet to prove this conclusively. Genetic polymorphisms (complement factor H, LOC387715 and HRTA). Smoking and LOC387715 polymorphisms may interact. Raised inflammatory markers such as C-reactive protein may be related although some studies such as Hogg et al. have not supported this. 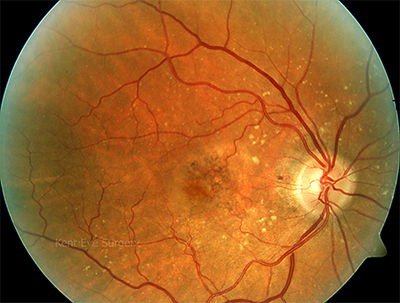 How these risk factors come together to cause AMD is not known. We believe that Bruch’s membrane, which separates the choroid from the RPE/retina becomes less permeable, which blocks the nutrition of the RPE and prevents waste products of the retina from escaping. 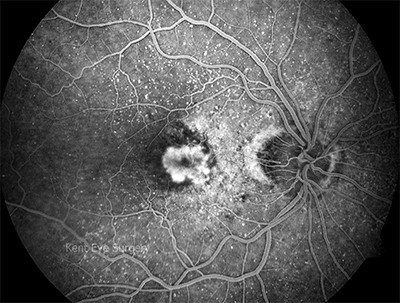 The quality of the retina deteriorates (dry AMD) and new blood vessels are stimulated to grow into the retina in an effort to clear away the waste products (wet AMD). These new blood vessels leak fluid and bleed, further impairing the function of the retina. How quickly does vision deteriorate in AMD? (Ophthalmology 2008;115:116-126) If visual loss is expressed in terms of the number of lines you can see on the Snellen Visual Acuity chart, vision loss progresses from one line lost at 3 months, to 2.7 lines at 12 months and 4 lines at 36 months. The proportion of patients not able to see the top letter of a Visual Acuity chart increased from 20% at presentation to 75% at 3 years. Wet AMD developed in the fellow eye in 12% patients by 12 months and 27% by 4 years. 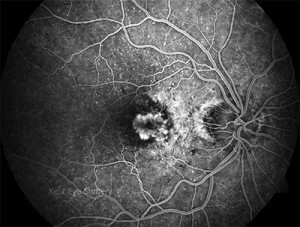 The following series of photographs demonstrate the clinical appearance of the fundus of a patient with sudden onset of distortion in her right eye.